City Carpet Workroom was established in 1963 by John A. Pulsifer. The business primarily provided installations and cleaning of carpets for department stores such as JC Penney, Montgomery Wards, etc. and local interior designers. In 1993 Dana Pulsifer purchased the company and moved the business to its current location at 1435 S. Euclid Ave.
City Carpet continued to provide work to department stores and also began focusing on commercial projects, mainly in the hospitality area. Some of their main clients are Loews Hotels, Westin Hotels, Radisson and others. City Carpet also provided flooring work for several general contractors and has been awarded government contracts such as with the VA Medical Center and Davis Monthan Medical Clinic. 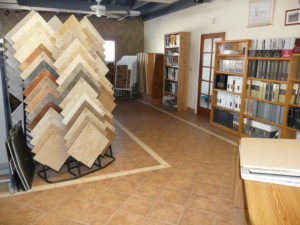 In 2007 Frank Romero joined the company with a focus on ceramic tile, stone, wood and laminate flooring. Mr. Romero has served in the floor covering industry since 1989 and is City Carpet’s Project Manager in charge of sales and ongoing projects. City carpet has expanded its services to offer the residential community quality floor coverings at reasonable prices. Since the start of the company in 1963, City Carpet has placed great value in doing quality work and providing great customer service. City Carpet tries to become an extension of our customer’s company and strives for a good long term working relationship with its customers.